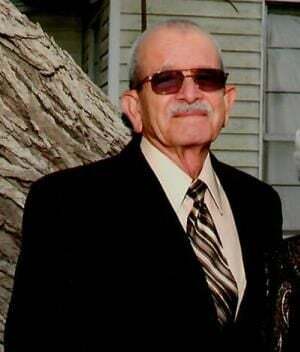 Albert Garza Garcia, 87, of Markham, Texas passed away March 24, 2019. He was born August 9, 1931 in Cuero, Texas. Albert’s life was about his family, his children, grandchildren, and great-grand-children. He loved the Tidehaven Tigers, Dallas Cowboys, home cooked meals, sharing stories about his life, and being an Army Veteran. But he especially loved his naps in his recliner. Albert was a very kind, loving person and took great pride in his country and family. He is survived by his children, daughters, Norma Trevino and husband Jaime, and Laura Garcia and husband Daniel; son, Juan Jose Garcia and wife Monica; seven grandchildren, John Garcia Jr. (Jennifer), Wendy Prindiville (Kevin), Albert Garcia (Natalie), Miranda Medina (Lance Sternadel), Daniel Garcia Jr. (Ashley), Steven Trevino (Rachel), Mark Garcia, Wilmer Sanchez and Ana Francisca Sanchez; great-grandchildren, Arianna, Albert Jr., and Nicolas Garcia, Gavin and Cameron Garcia, James Medina, Alexander Garcia, Alyse and Nolan Prindiville, Harley and Allix Trevino; special friend, Gloria Silva; sister, Gloria Ramos; brother, Sammy Garcia; as well as many cousins, nieces and nephews. Albert was preceded in death by his wife of 55 years, Lucia R. Garcia; parents, Domingo and Hirene Garcia Sr.; sister, Stella Lopez, Dora Castillo-Garcia, Juanita Garcia, Olivia Medina; brothers, Ignacio, Pedro; Domingo, and Richard Garcia; and great grandchild, Cameron Garcia. The family will receive friends and relatives from 5 p.m. until 7 p.m. Wednesday, March 27, 2019 at Taylor Bros. Funeral Home in Bay City, with a rosary at 6:30 p.m.
Funeral Mass will be 10 a.m. Thursday, March 28, 2019 at St. Peter’s Catholic Church in Blessing, Texas. Interment will follow at Roselawn Memorial Park in Van Vleck, Texas. Pallbearers will be grandsons, John Garcia Jr, Albert Garcia, Daniel Garcia Jr., Steven Trevino, Mark Garcia, and Lance Sternadel. Honorary pallbearers will be Kevin Prindiville, Pasqual Martinez, Ted Fuentes, and Pete Garcia Jr.
Albert Garica’s family would like to thank the following, Mr. and Mrs. Jeff Nemec, Mr. and Mrs. Ted Fuentes; care givers, Leticia Sanchez and Nancy Salazar; nurses and staff at Bay Villa Nursing home, his favorite nurses Teena, Brandi and Margie, the staff at Bay City Regional Dyalisis Center and A-Med Hospice. Arrangements with Taylor Bros. Funeral Home, Bay City, Texas; 979-245-4613.